The Panhard AML was birthed as a private venture by the Société de Constructions Panhard et Levassor, a military subsidiary of PSA Peugeot Citroën. It was derived from the Daimler Ferret, offering important similarities in external design. The first prototype appeared in 1959 and the vehicle was put into production in 1960, with more than 4,000 examples constructed by the time production ended. In the late 1950s, the French Army successfully operated a number of Ferret scout cars in Algeria. 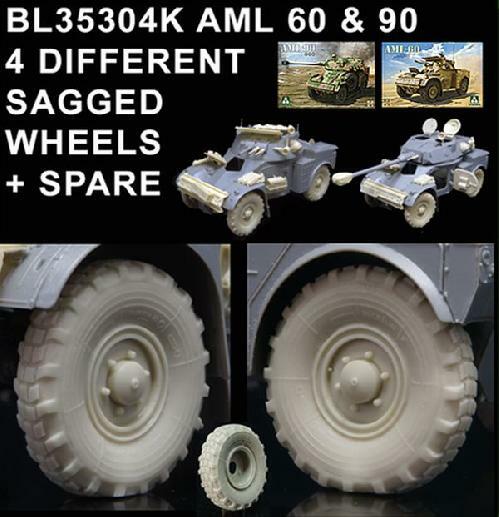 Impressive as they were from a conventional standpoint, the rest of France's existing light armour such as the Panhard EBR and M8 Greyhound were not suitably equipped for counter-insurgency; battles of the Algerian War often involved short, sharp, skirmishes which required indirect fire support weapons such as mortars rather than solid shot and shell. In addition, the North African conditions demanded a lighter, less sophisticated, vehicle which would be simpler to maintain and operate. As an interim measure France had purchased two hundred Ferrets from the United Kingdom.These were light enough but carried only a single general-purpose machine gun, which was inadequate for offensive purposes. Nevertheless, they were sufficiently successful that there was a possibility of producing the Ferret under licence in France. However, Saviem, Berliet, and Panhard petitioned for bidding on a home-grown vehicle, and in 1956 the Ministère de la Défense issued specifications for an indigenous wheeled armoured car of similar dimensions and layout to the Ferret but mounting a breech-loading mortar. By 1959, this had emerged as the Auto Mitrailleuse Légère, designated Model 245 "B" by Panhard. Early prototypes were completed in mid-1959 and by the end of 1961 at least one regiment in Algeria was receiving them. 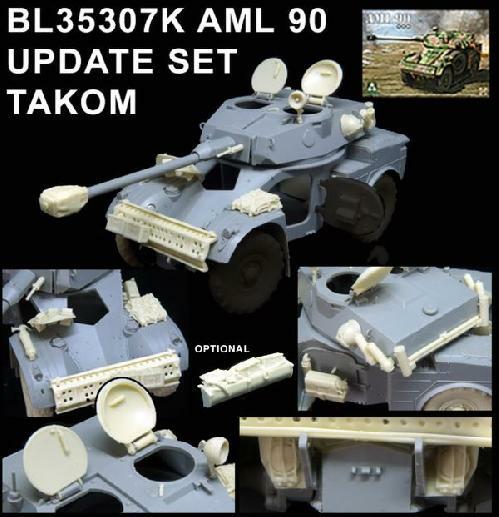 The AML was equipped with a 60mm Brandt gun-mortar and two medium MAS AA-52 NF-1 machine guns. Until Panhard's acquisition by Citroën later in the 1960s, it was manufactured at a single plant near the Porte de Choisy in the 13th arrondissement of Paris. The AML was immediately successful, but as the Algerian conflict diminished so did the need for a light mortar carrier deployed in anti-guerrilla operations. 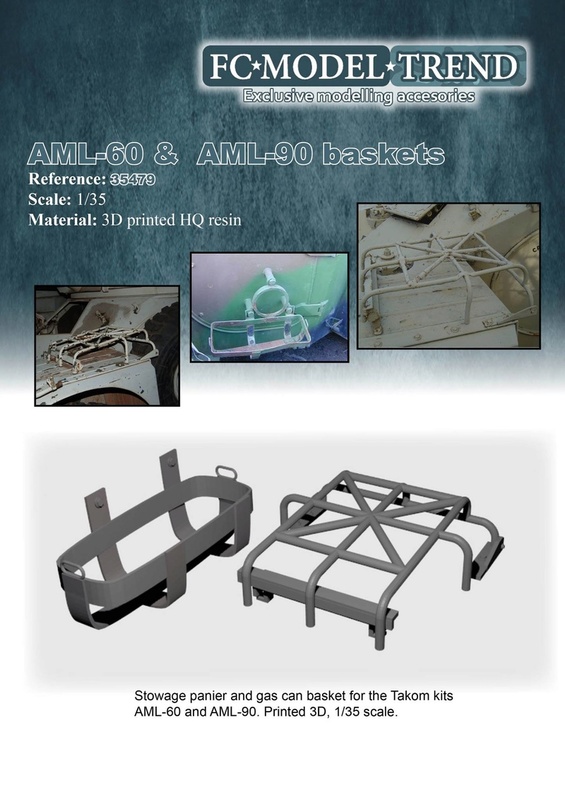 Mass production of the AML likely ceased at some point prior to the early 1980s. However, AMLs continued to be sold from French Army surplus stocks as late as 1999, when the final export orders were placed by Yemen and Tunisia. They were also marketed by a number of other second-hand suppliers, including South Africa, Israel, and Saudi Arabia. Fitted with coil spring suspension and drum brakes, the AML lacks hydraulic assist on either brakes or steering; only front wheels steer. Consequently, the steering wheel requires considerable strength to turn while the vehicle is in motion, while stationary it remains effectively locked. Much like the Ferret, rear wheel drive is transmitted directly to epicyclic hub reduction gears, also known as bevel boxes. The motor and gearbox have been harnessed via a centrifugal clutch with electromagnetic control, eliminating the need for a clutch pedal. This type of clutch is automatically engaged by gripping the knob of the gearshift lever, which is located behind the driver's seat in the hull floor. The gearbox assembly consists of two separate gearboxes, one for high and the other for low gear. The low-range gearbox is designed for off-road use and has a reverse gear and a top gear, while the high-range box is for operation on roads and has three low gears and one overdrive. There is a hydraulic dual-circuit handbrake operating on the gearbox output shaft. An AML's crankshaft is carried in three ball bearings to reduce motor friction. Powerplant design was inspired by the Panhard EBR and incorporates an air-cooled 1.99 litre four cylinder engine developing 67 kW (90 hp). The Panhard engine was somewhat underpowered for the five to six tonne armoured car, and remained prone to mechanical failure in humid climates. Under temperate conditions it was capable of providing good operational service up to 26,000 kilometres before needing replacement. Known more formally as the AML HE 60-7, or by its manufacturer's code AML-245B, the AML-60 was Panhard's initial production model and included a rounded turret with twin 7.62mm machine guns on the left and a breech-loaded 60mm (2.36 in.) mortar on the right, with 3,800 stored rounds of 7.62mm ammunition and 43 to 53 mortar projectiles, respectively. The mortar can still be muzzle loaded from outside the vehicle, but is unique in its opening breech locked by a falling block much like direct fire artillery. It has an elevation of 80° and a depression of −15°. Two types of mortars are available: a Hotckiss-Brandt CM60A1 or, in later production models, a Cloche Spéciale (CS) 60 designed by the French government's Direction technique des armements terrestres (DTAT), which was distinguished by its ribbed barrel. The ergonomic dimensions of the CS 60's ammunition allow ten more mortar bombs to carried for a total of 53, as opposed to the CM60A1's 43. Both can be fired on a flat trajectory and are effective at no more than 300 metres in the direct role, or 1,700 metres in the indirect role. 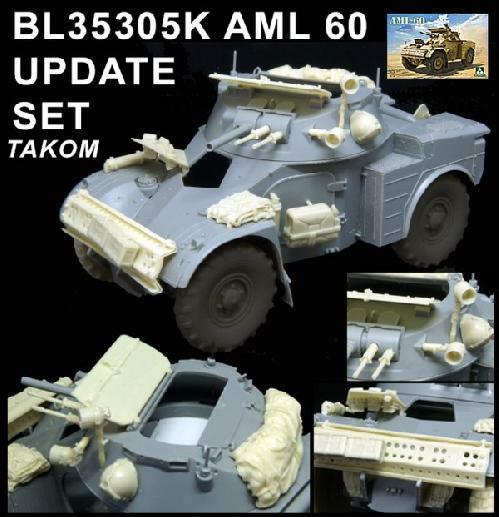 Separate combat and command variants of the AML HE 60-7 turrets were manufactured, the latter being fitted with additional radio equipment and therefore possessing comparatively limited stowage. The number of stored ammunition is reduced to 32 mortar bombs and 3,200 7.62mm rounds, respectively. An AML-60's crew commander acquires targets, directs the gunner, and makes a series of ranging and ordnance calculations to ascertain firing angles. Sighting is optical, and carried out through an M112/3 combined monocular telescope and binocular periscope. Elevation aiming control is linked to the mortar but provision made for manual scanning. In late production models, thea micrometre markings on the sights could be illuminated for night firing. 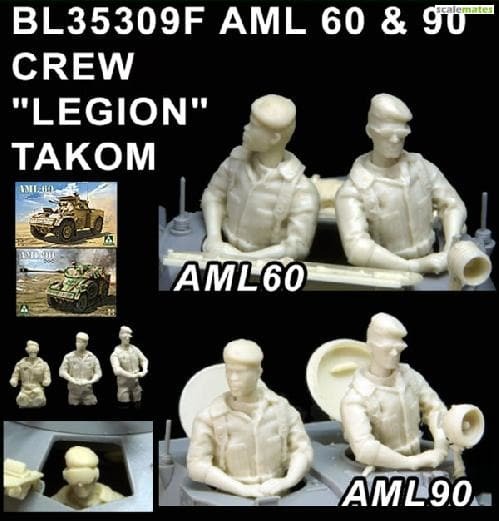 AML hulls are assembled from only 13 welded pieces, with a driver seated at the front of the hull and the turret to his immediate rear. Above both doors the hull widens into a circular flange onto which the turret is bolted. This makes the turret basket extremely cramped, and little space is available above an AML-90's turret ring due to the massive gun breech and somewhat haphazard ammunition stowage. There are optical ring sights in front of both turret seats for quick laying of the main armament. 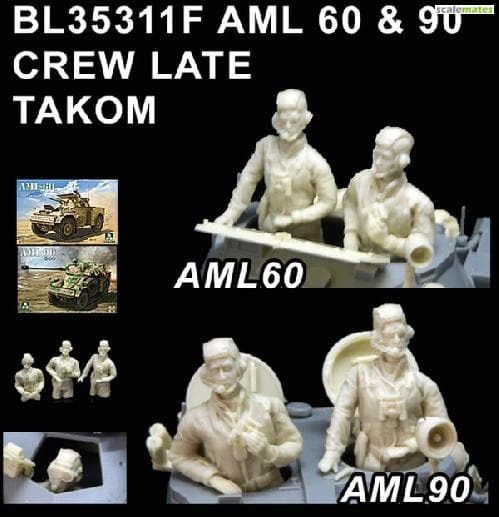 AML turrets have a two-man crew, with the commander seated on the left and the gunner on the right. Depending on the variant, either may operate the roof-mounted searchlight. Seven periscopes are provided for the turret crew and three for the AML's driver. One of the three driving periscopes may be substituted with an infrared or image intensification periscope for night operations. On either side of the hull below the turret ring is an access door, one for the driver on the right and one intended for emergency purposes on the left. The left hull door, on which a spare wheel and tyre or fuel cans may be mounted, opens to the rear while the right hull door opens to the front. The engine housing at the rear of the hull is accessed through two access panels, and is insulated from the crew compartment by a removable bulkhead. Two sand channels resembling those on the Ferret are bolted to the hull front for crossing ditches and other obstacles. The AML uses nitrogen inner tubes (in this case Hutchinson V.P.-P.V.s) adopted from the EBR, providing run flat capability on 41 cm (16 in. )-diameter wheels; its 280mm (11 in.) wide Michelin tyres can be deflated to reduce ground pressure to as low as 70 to 110 kPa (10 to 16 psi). 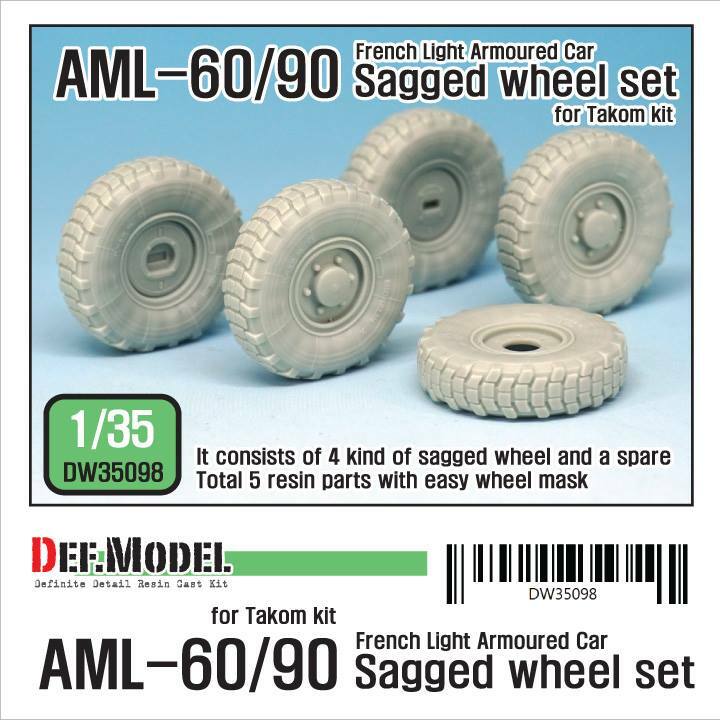 These have been replaced in some Anglophone armies by the Dunlop Trak Grips also favoured in Bedford and Alvis military vehicles . This information has been taken from the Wikipedia Page entry. 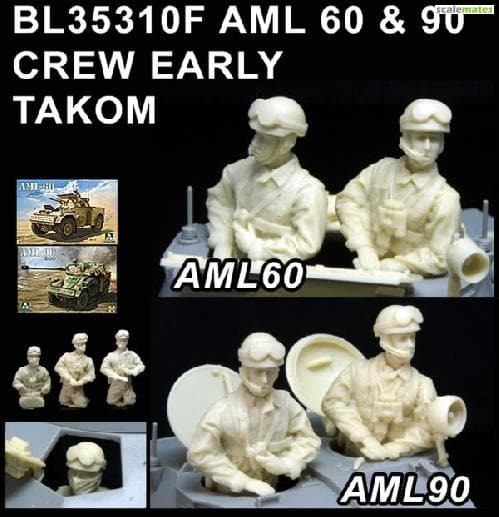 Before TAKOM had the excellent idea to produce this interesting styrene version of the AML family, AZIMUT in France and KMR in Spain produced their own resin version, both being fairly good but not perfect, suffering small inaccuracy and lacking lots of details. When I opened the box, I quickly reached a very positive opinion; mouldings are very clean. Like most models, some ejector pin marks will need a little bit of filling and sanding. The assembly of the engine deck covers is pretty straight forward. As I didn't know exactly how far down I had to glue the part H16 (engine cover), I chose to glue the part H15 from step 2 first. The two engine access panels E41 are then set in closed position, as well as the stowage basket H10. I will maybe change my mind on this one and re-fix it in the opened position and use some Value Gear tent and tarps to fill the space. The rear part H15 shows the rear lights. They have crisp details. The exhaust is made of 3 parts E4-E5-G34. Attention should be paid when cutting tiny parts E1 and G3. Part G3 has a flat side and an engraved one. Be aware of that before cementing. Driver's door H5 fits perfectly. I glued the front lights supports E38 in place, but not the transparent parts J, allowing me to paint the inside of the headlights before. Rear parts E17 and E18 fit together perfectly. That is where you start to assemble the rear fenders, front steering parts and small details. Maybe the most challenging part of this build. Front wheels are steerable and attention is required to assemble the numerous tiny parts. Talking about glue, « less is more »... Dry fitting the subassemblies is always good ! Parts H11 and H12 are very thin and need sanding. Fire extinguisher, front lights, everything fits perfectly. Beware of carpet monster, some parts are really small ! Prepare 2 sets for the front wheels and 2 sets for the rear wheels. Note the tire pattern direction. Do not forget to glue persiscopes E13 (x2) and E14 before gluing drivers hatch. Nothing difficult here. I did not glue parts G36 and G37 (drivers side mirrors) at this stage, to avoid breaking them during the build. Do not sand the two tiny pins at the back of part E18 (side fire extinguisher). Unfortunately, the inside of this AML is empty... you have no other option but to leave the hatches closed here as there isn’t much interior detail to show off. Part E16 (x2) is very fragile. I think it is better to glue them at the very end of the build. I did not assemble the two searchlights at this stage (parts E11 and E12 and transparent part J), allowing me to paint them before. 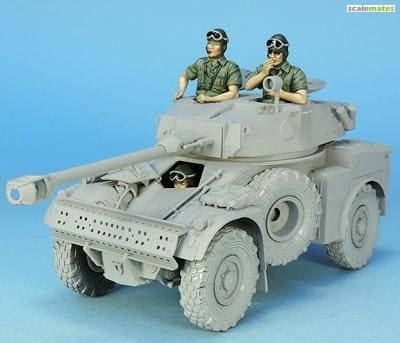 Overall this kit is a high-quality model with lot of accurate detail. Fit is perfect. 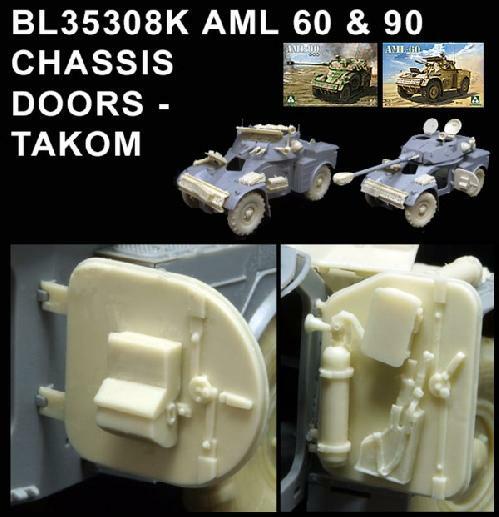 It would have been nice if Takom had molded some interior parts. You have no choice but to leave all doors and hatches closed, except if you are a scratch building specialist. Highs: Clear and crisp moulding. Lows: Too soon to tell. Verdict: At first view,this kit appears to be accurate. This impression needs to be confirmed during build review. 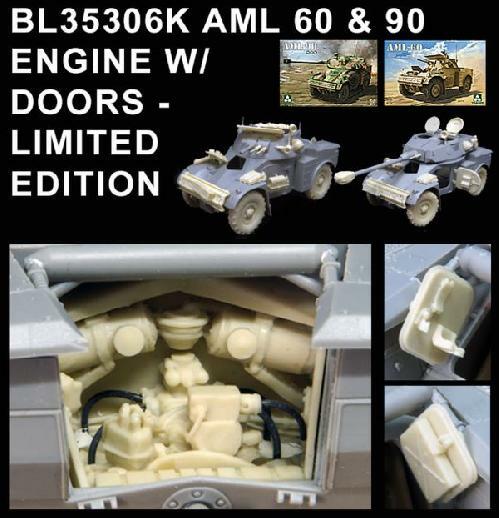 Blast Models recently released a AML resin engine set, and other AML goodies, as well.